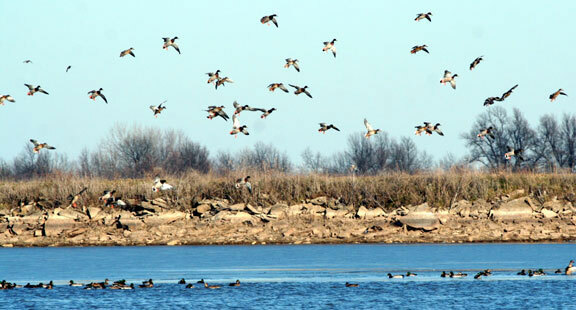 Wade-in waterfowl hunts within Mid-America Hunting Association are wetlands without blinds. Waterfowl hunters would reserve anyone of a number of wade-in spots, mostly for ducks, have that reservation for a day or two, set their own blind in addition to their own decoys. Wade-in waterfowl hunts areas are typically for duck hunters that like to set up on their own with layout boats or their own make shift blinds. This is true unguided duck hunting with the benefit of no public wetlands hunter mentality. Recent years have seen more and more retriever dog hunters using the wade-in areas in conjunction with our permanent blind wetlands to work their dogs for the enjoyment of the dog work more than the ducks. Several designated wade-in areas once had blinds but the bird pattern from year to year with fluctuating water levels was unpredictable and it’s to the hunter’s advantage to set up own their own. This combined with increased requests from mostly retriever hunters for more shoreline areas has resulted in expanded wetlands and tree cutting. If you reserve a wade-in area we will not allow another member to hunt the same area on the same day unless you request us to do so. Many hunters with inexperienced young dogs prefer wade-in areas so the dog is not confined to a blind and the dog has greater visibility of the game. On several of our properties with irrigation lakes the landowners discourage permanent blinds because they interfere with their equipment during the off season. Many of these lakes are designated wade-in areas that are greatly under utilized, but on the right days as good or better than many of our wetlands with permanent blinds. Each wade-in pool is sufficiently large enough for an entire day’s hunt and with the right spread and calling any nearby flights should be able to be decoyed in just as well as in the duck blind areas. The water surface looks deceptively small in this picture. It is much larger than it looks. This entire area to include that beyond our lease is lowlands that collects and retains water through the year and gives no elevation for a good picture. This is an example of how our self guided hunts work. We make this type of information available and then the hunter must experience the hunt for himself. The confidence this spot is a good do it yourself duck hunt location is that we spent money to make it good. 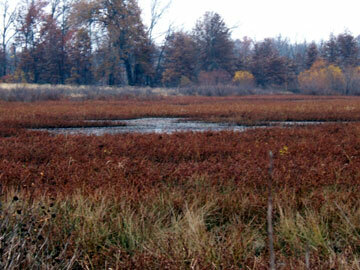 Pictured is a wade-in area on one of our wetlands. 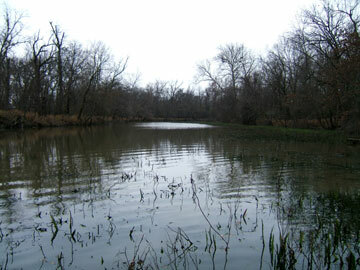 The “wade-in” designation means a shooting pool within a wetlands where the wetlands has duck blinds on other pools, just not the one marked as “wade-in” on the wetlands maps. The collection of ducks and geese show this to be more likely one of our open water hunts. 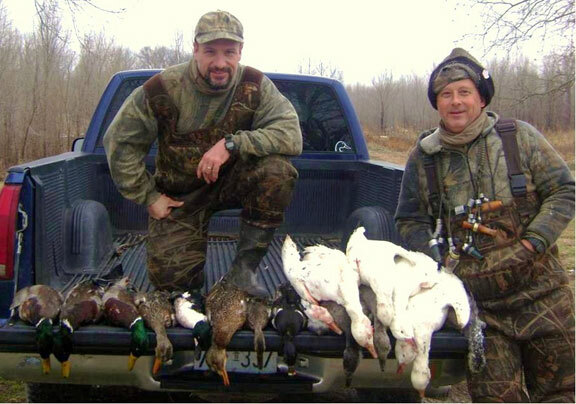 This group that generously sends in pictures each year prefers to hunt a combination of wet and field sets over wade-in, farm ponds and watershed lakes. The interesting part for many is that good duck and goose hunting is available on other than the Association’s enhanced wetlands. Many other Association lands in the right spot yield good hunts.